Let the system tell you what it already knows. There is no need for you to remember all addresses and hand code it. Gamesontrack can analyse your existing layout just by running on track and by activating the accessories. Let the system handle this with automatic learning. Automatic learning is a feature in Gamesontrack. Lean back, select ”Monitor” in the menu ”Game” and activate ”Log activities” and “Automatic learning”. 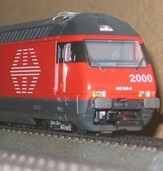 Drive your trains on the layout using your CS/ECoS/Intellibox/Twincenter/Roco 10785. Immediately, GT-monitor builds all trains, accessories, and blocks. You only have to deselect the ones that you do not want to be included in your layout description. Now you just need to decide on names (the grey fields) since all the addresses (the red fields) have been collected and the comment field contains what may already be described in the controller. You are now ready to monitor and command your model railway using voice control, and you are ready to automate.